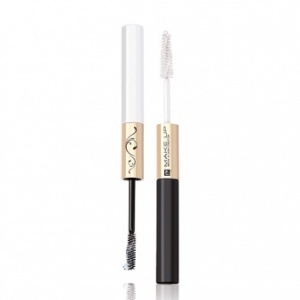 This 2 x 7 ml Brow and Lash Creator is an irreplaceable duo of brow gel and mascara base that allows to create a charming look and create a perfect eye make up. The transparent gel perfectly arranges unruly hairs and preserves the shapes given to the brows. It strengthens, regenerates and nourishes the brows, giving them a healthy beautiful look. Nourishing mascara base immediately thickens and lengthens lashes, giving them exceptional volume that will intensify the effects of mascara usage. The mascara base strengthens lashes day by day, stimulates their growth and prevents them falling out. The shape of the brush allows precise application and allows to reach even the shortest hairs.